Winnemucca is served by BNSF and the Union Pacific Railroad. 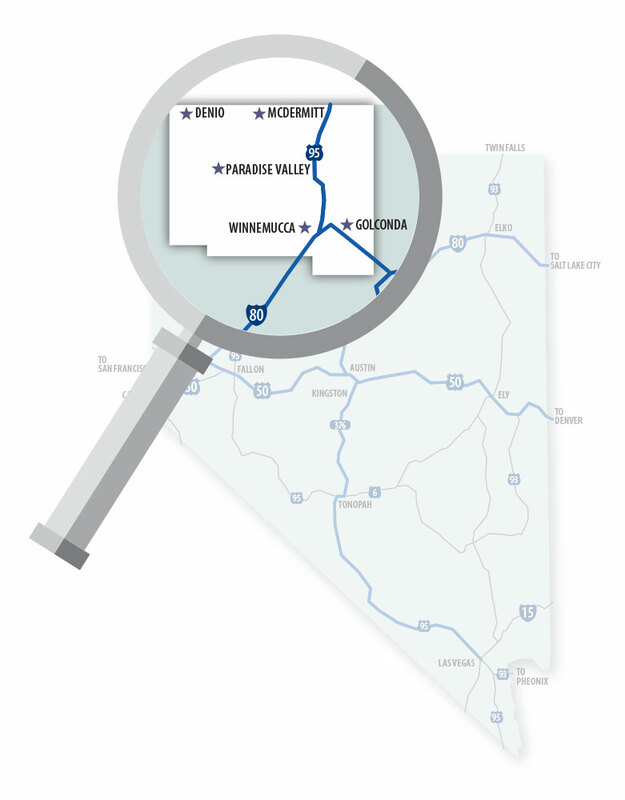 Amtrak also has a station with daily trains connecting to Reno, Elko, and all points across the U.S.
First settled in 1866, its heyday was between 1898 and 1910 when it served as a copper processing center for the Adelaide mine. The Golconda School is listed on the National Register of Historic Places. Although its population numbers under 300, it is the home to Diamond Plastics, a manufacturer of plastic pipe and extruded finished plastic products. Approximately 80 are employed and the facility. Golconda is located just off I-80 at the Golconda exit 194. Winnemucca is a crossroad of the West! Interstate 80 provides access to major centers of commerce, culture, and population including San Francisco, Sacramento, and Reno to the west. Elko, Salt Lake City and Cheyenne to the East. Highway 95 reaches north to Oregon and Idaho. A few miles to the west, Highway 95 stretches south to Fallon, Hawthorne, Beatty and Las Vegas. Rail access, including Amtrak service, is provided by the Union Pacific Railroad. Two separate mainline tracks, each with multiple spurs, are located in Winnemucca. The Winnemucca Municipal Airport is well suited for general aviation, charter service and airfreight.